Sounding something like a soundtrack to a freaked out experimental sixties movie, including sudden abrupt scene changes, this album is essential to anyone that has fantasized about painting their girlfriend in the colours of the rainbow. Infectious grooves and anachronistic guitar sounds, sound effects, drones and sci-fi warbles, tremolo fuzz and primitive drum machines, glued together by dub and retro bass lines, trembling organs and gongs, percussion and perhaps a sneak listen to Harvey Mandel’s magnificent Cristo Redentor (1968) via Michael Karoli makes for an irresistible trip into the futuristic past. The title has you wondering if various personalities exist in the same brain and this Psychedelic Garage nugget makes you wonder if being a Chilean in Berlin might be the answer to cracking the creative code. STEREO 1/4″ Tape Master Mix. Available on 12″ Full Stereo Vinyl by BYM RECORDS and special Mono Mix Tape Cassette by E.T.C.S RECORDS. 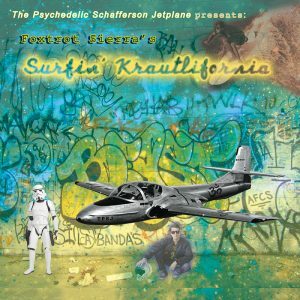 An Exotic blend of Fender driven tracks of Instrumental, Blues, Surf, and New Age Synth sounds. Gear: Telecaster, Jazzbass, Fender 63 Reverb, Vox AC4, Dunlop Wah, Snake Charmer Comp., Arion SCH-Z, Electric Mistress, Small Clone, Ultra Tremolo, BBD Chip Echo, Silicon Fuzz Face, Big Muff, Crunch Box, American True Tone, C9 Organ Machine, Roland JV-80, Sampler/Drum Machine, Ethnic Percussion, HF Transceiver, Analog TV Set, ART Tube MP, various Reel Tape Recorders, AT-804, SM-57.